This traditional 3 reel game will have you spinning the reels for a chance to strike gold! Click here to play! Check it out for a shot at a very handsome payout. You’re on a search for gold in this jackpot game, and if you’re lucky enough to find it you’re sure to take home a very big payout indeed. There are single, double, and triple golden BARS to spin across the reels, each one holding a top payout. In fact, three triple BARS will award the progressive jackpot. Three double BARS across the single payline awards 5,000 coins, and three single BARS will gain you a top payout of 2,500 coins. 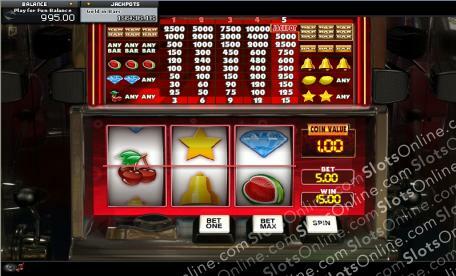 Don’t overlook the other symbols filling these reels as they too will help you amass your fortune. These include watermelon, lemons, cherries, diamonds, bells, and stars. As this is a traditional 3 reel game, it features a coin wagering system. Be sure to put down all five coins to activate the jackpot pay table. Then, spin the reels for a chance to strike gold!